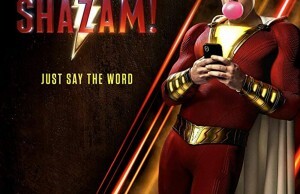 What’s going on?! 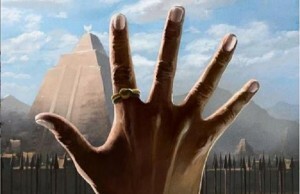 Did someone somehow peek into my mind and saw exactly what I need? I was always a fan of a camping… in theory. In practice, never managed to stay longer of 2 or 3 days in mother’s nature lap in a tent without a comfort of an average hotel room, despite all the beauty around. People from Holleyweb have invented something that fulfils my contradictory needs. 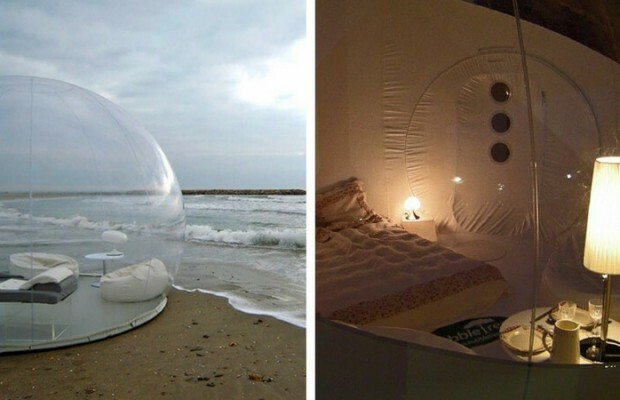 They introduced an inflatable, PVC, transparent, inflatable bubble tent that lets you live outside, but with all the comforts of home. Yet, they might have peeked into my mind but have missed peeking into my wallet. 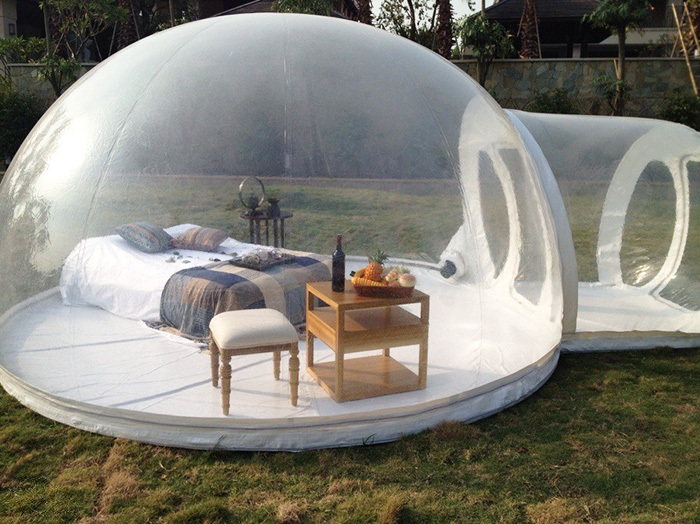 The price of this dream-come-true tent is $2000, a bit over my head at a moment, but still entered long-term plans. Besides it’s comfortable it is waterproof and fire retardant. 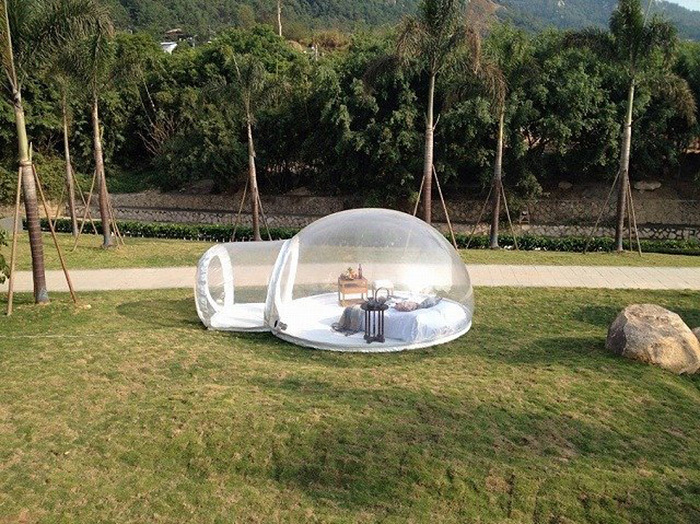 There is enough space for two people in this incredible four-meter tent. 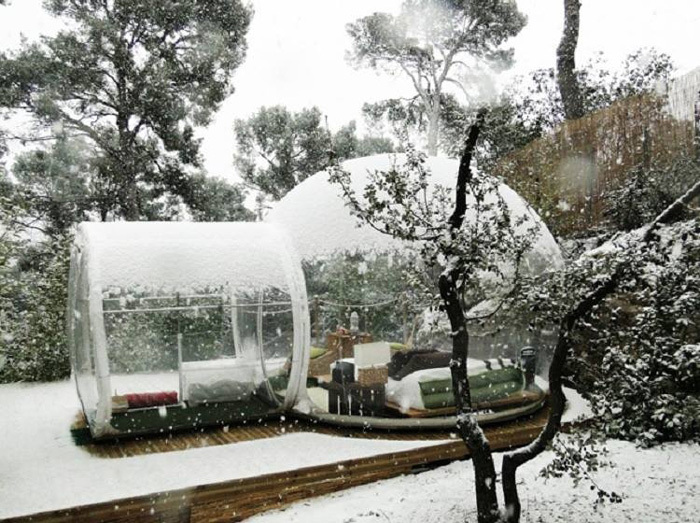 Oh… just imagine the starry nights! The only flaw is that you need somewhere to plug in the tent’s blower, which is necessary to keep the tent inflated… I certainly hope the soundless one. 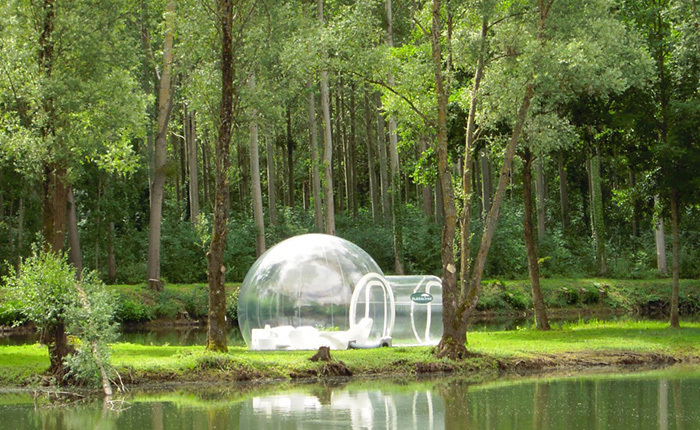 Panoramic view of the countryside is possible with this inflatable bubble tent. 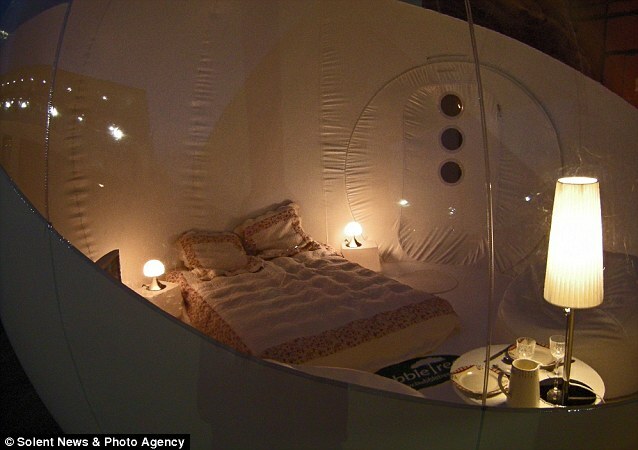 French designer Pierre Stephane Dumas responsible for the creation said these are “unusual huts for unusual nights”. “Having a night under the stars or seeing the sun rise and set is not something that many people experience anymore. 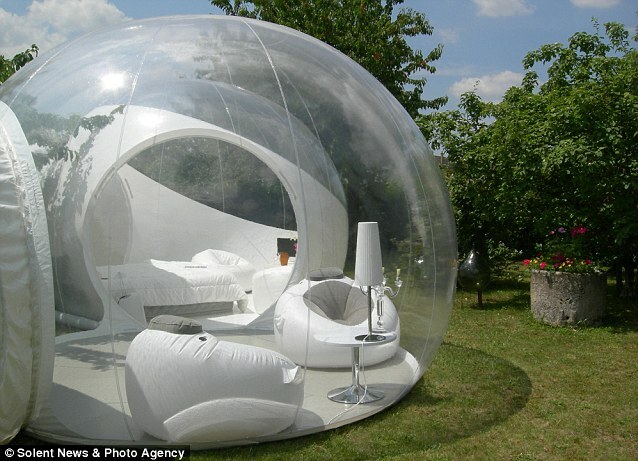 A normal tent or camper van means people miss out on these things. 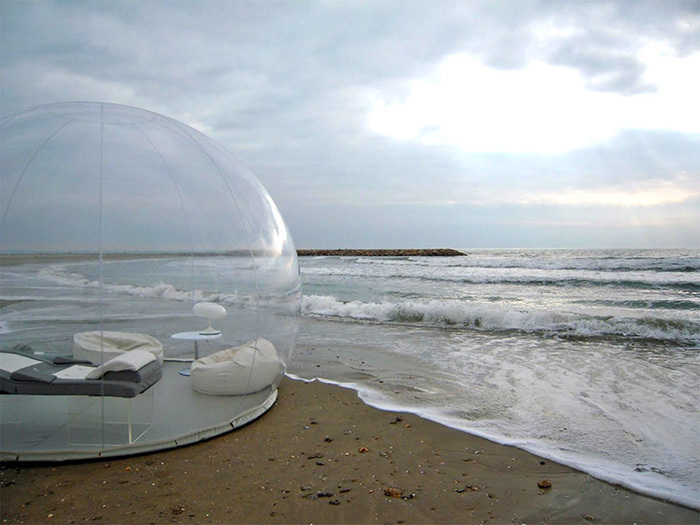 So I designed this eccentric shelter with the aim of offering an unusual experience under the stars while keeping all the comfort of a bedroom suite. 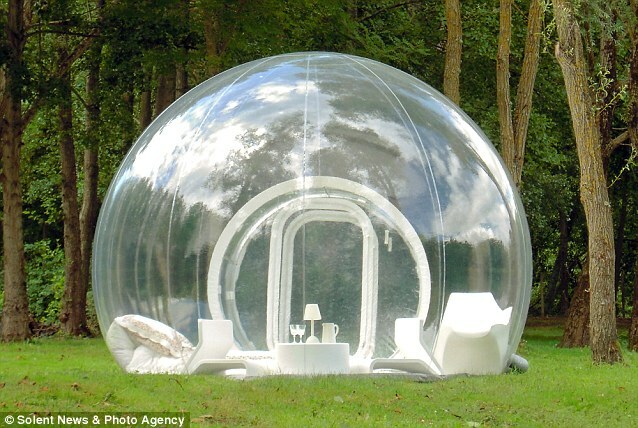 If you think of curtains while watching this tent, Mr Dumas has also created another one, which he calls a ‘cocooning’ version of a bubble tent. Also completely opened to the sky but a surrounding wall means the occupants can not be seen from the outside.